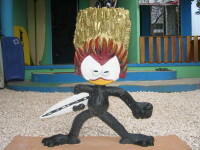 Alex's Surf Shop and Surf School is located between Mal Pais and Santa Teresa, Costa Rica, on the Pacific Coast. We have the largest variety of used boards for sale in this region, a complete line of surf gear, leashes, sandals, board shorts, and much more. We are committed to guaranteeing the best price, quality, and choice, in the region. We also have in house surf instructors that have tought the world over. Also note we have a Taxi Boat for custom surf trips all over Costa Rica, in your rarest locations. Alex has been in business since 2000, and grown exponentially each year. We continue to keep the best possible merchandise, as Alex travels all over Costa Rica to find the best quality used boards, maintaining the affordability necessary to make surf travelers happy. The Taxi Boat Surf Tours have also become in popular demand, as the lineup fills up, those needing that extra space can take a custom journey to the perfect spot Without others dropping the same waves. We thrive on customer satisfaction. If you are not satisfied, let us know, and we will do whatever we can to make sure you never need another shop to fulfill your surfing needs. 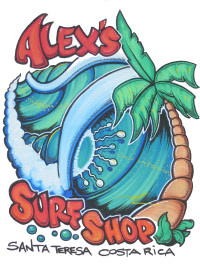 Alex's Surf Shop is open from 8 am till 7 pm seven days per week. You are coming to my house, so I should always be around. Come by and say hi. We offer a wide variety of sizes, including soft tops for you beginners, so you will never have to bring your board on the flight. Come down and we will fit you to the best board for your skill level and your desired effect in the water. Alex travels Costa Rica making sure you have the best selection of used boards. We have in house professional ding repair to make sure each board is in perfect condition. We carry a full line of Lost gear, Dakine leashes, sandals, wax, Maui board shorts, and much more. We have at your service a boat taxi that can be used for a wide variety of activities. We offer customized surf tours, traditional taxi services, as well as sport fishing trips and tours. We have one of the best sportfishing possibilities on this coast, so please don't miss this experience.